Effective communication is achieved when readers or listeners are able to grasp and understand the message you are trying to convey. However, the challenge in delivering effective communication relies on how you present your sentences. This article aims to guide you in building grammatically correct sentences structure and eventually deliver message effectively. English sentence structure of syntax is the arrangement of words inside the sentence and if you don’t know the grammar you may build the structure of the sentence in the wrong way, for this you may need sentence structure correction. To understand syntax better, you must understand the basic parts of the sentence – the subject and predicate. Subject refers to the topic of the sentence while the predicate tells something about the subject. 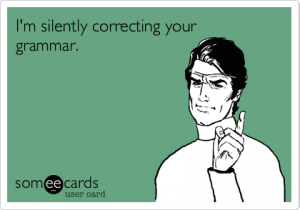 Important information to take note in sentence structure correction is the type of sentence you use. A sentence can be simple, compound, complex, or complex-compound. A simple sentence has one independent clause while a compound sentence has two independent clauses joined by a conjunction. Complex sentences, on the other hand, have one independent clause and one or more dependent clauses. Compound-complex sentences have at least two independent clauses and one dependent clause. To make readers and listeners understand your message, you have to build them in a structure they can easily comprehend. The following tips will help you build better and stronger sentence structures with correct grammar and punctuation. Fix run-on sentences. Run-on sentences are sentences composed of two or more independent clauses without any conjunction of punctuation. Example: I went to Mexico last summer it was the best vacation I ever had. You can fix it by separating one independent clause from the other and by putting a period on each. Avoid fragments. Another problematic sentence structure is fragments or unfinished sentences. Example: I played video games for an hour and then went to store after noticing that I am out of soda. Fix these fragments by breaking out the sentences and completing the subject and predicated of each. Eliminating comma splices. Comma splices are the incorrect use of a comma in joining two or more independent clauses to create a single sentence. Example: I bought a very cute new puppy, he ate my very expensive bag. You can correct this problem by separating the two independent clauses in two different sentences or by putting a conjunction between them. Read more about sentence structure. English syntax is easy to understand once you get the techniques. You just have to look for independent clauses (clauses that can stand on their own) and make them a single sentence. Start with simple sentences. They are easier to understand and to correct. Start with the simple ones and then gradually upgrade by using conjunctions. Once you are familiar with the rules, you can jump to compound and complex sentences. Another way to help you with your sentence structure problem is to correct sentence structure online through a program-based tool. This tool allows you to correct your sentence structure, especially when you struggle organizing different complex and compound sentences. This tool is computer generated and it is still advised to read and review the output once delivered. Learn more ways to correct sentence structure today! What Makes a Sentence Grammatically Correct? Find out Now!